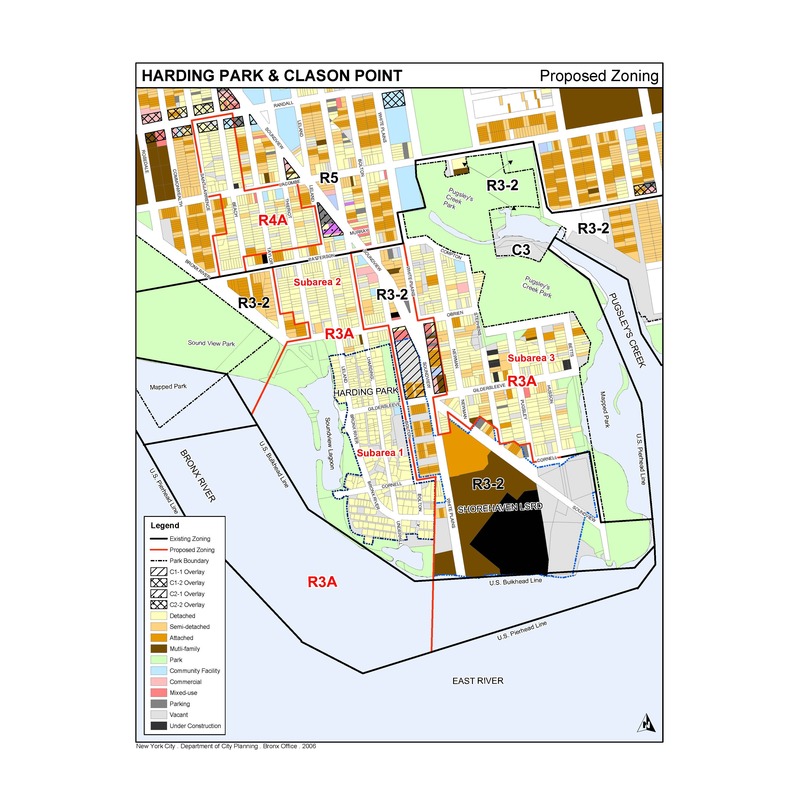 Harding Park/Clason Point Rezoning. Proposed Zoning used with permission of the NYC Department of City Planning. All rights reserved. Rezoning encompasses unique residential co-op on Bronx waterfront. Responding to concerns over increasing out-of-scale development, City Planning initiated rezoning studies of Harding Park, Clason Point and Park Stratton in the Bronx, ultimately proposing to rezone 47 blocks. Under the proposal, 34 blocks of Harding Park and Clason Point, located along the peninsula bounded by the Bronx River to the west, the East River to the south and Pugsley’s Creek to the east, would be rezoned to generally reduce the minimum lot size, further restrict building heights and prohibit multifamily housing. Both neighborhoods consist of low density oneand two-family homes. Harding Park originated as a campground that summer residents converted to year-round homes during the housing shortage following World War II. Its residents later fought with the state and the City to remain, ultimately forming a co-op to purchase the land from the City. It is still characterized by narrow, unmapped streets, and some original bungalows remain. Parks controls a 1.1 acre portion of its waterfront. The Park Stratton plan proposed to down-zone 13 blocks of the southeastern Bronx neighborhood from an R6 to R5 zoning, limiting building heights to 40 feet, adding yard requirements and restricting building floor area to 1.25 times the size of the lot. The current zoning provides no building height limit, no rear yard requirements and up to a 2.43 FAR. Additionally, the rezoning called for the commercial zoning overlay along Bronx River and East Tremont Avenues to be changed from C2-2 to C2-4 and reduced from 150 feet to 100 feet to minimize its encroachment onto residential blocks. At the public hearings on the rezoning, only one resident of Park Stratton opposed, complaining that his 1896-built, three-family building would violate the new zoning. The rezoning would eliminate his ability to rebuild his building if a fire or other incident destroyed it. Approving unanimously on April 11, 2007, the Planning Commission emphasized that the Harding Park/Clason Point plan would limit overdevelopment and the Park Stratton rezoning would end construction of buildings with no yard space and no height limit.